One might say that the Langkilde Lab is extremely fecund. Over a four-year period we welcomed five babies to the lab! One could make several hypotheses to try to explain our reproductive success – something in the water, something in the air… personally, I think our fearless leader, Tracy Landkilde, has created a safe environment conducive to child rearing. But, whatever the reason, regardless of whether it is related to Langkilde Lab-ness, on April 30, 2014, I joined the parent circle. 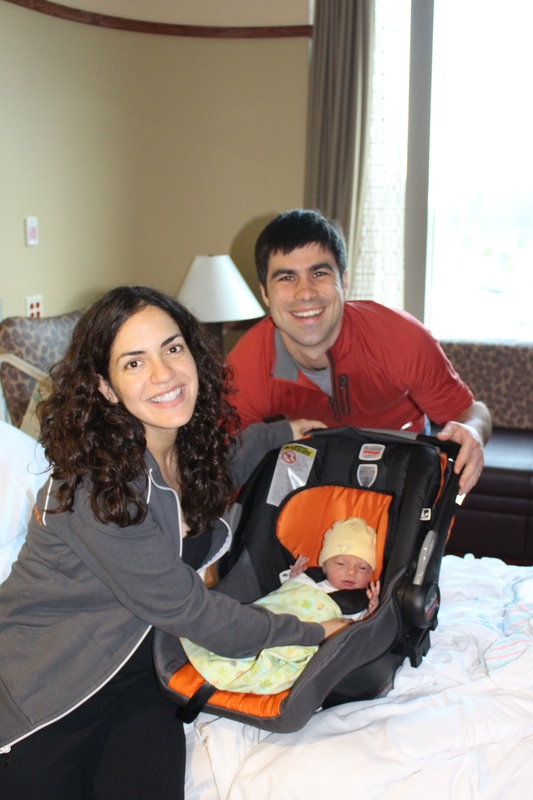 Getting ready to head home from the hospital with my husband, Travis, and our daughter! After the visitors left, the Mylar balloons deflated, and the gifts stopped trickling in, I was hit with the reality about the remaining work I still needed to do in order to complete my dissertation. Decades ago, my grandmother had been a graduate student studying psychology at the University of Wisconsin, and had chosen to leave the program following the birth of her first child in order to support my grandfather, also a graduate student. This was during a time when work-life balance wasn’t a buzzword, and there was virtually no support for female scholars raising families. Determined to complete my PhD, and with many parent-scholar role models in my life (several from the Langkilde lab! ), I devised a plan to find the time necessary to write my dissertation. Often the places and ways I worked were unusual at best. Below I have compiled a Top 6 list of sorts – that is, a list of the bizarre and peculiar places and ways a mother to an infant found the time to write her dissertation. “Jenny’s Lair” – an affectionate term for the makeshift office I used during the three months we lived with my in-laws in Wisconsin: an attic bedroom accessed by a narrow closet that led to a Swedish-style step-ladder. Every time I had to go to the bathroom I had to carefully descend the steep ladder – one misstep would send me crashing into the wall (which happened). One-handed. I needed to hold my baby with at least one hand to support her while nursing. This meant I had one hand doing nothing. A dissertator mother can’t afford to have one hand doing nothing! So, I would grab my computer and hunt and peck away at the keyboard. And let me tell you, I got very speedy at one-handed typing! Kneeling in a completely dark bedroom, except for the glow of my laptop. I needed to keep the light off so my daughter would sleep. I couldn’t leave the room because she had fallen asleep on our bed and might roll off. I couldn’t put her in her own bed or she would wake up during the transfer. Solution? I grabbed the nearest cardboard box to use as a desk, and resumed my work in the dark. On my belly on the floor, laptop in front of me, with a sleeping baby sprawled lengthwise along the crook of the backside of my legs. She wanted to sleep so badly, but wouldn’t do it unless her body was touching mine. Jenny’s Mobile Office. My daughter’s naps were predictably unpredictable. They always occurred, but only when she finally surrendered to let sleep overtake her enthusiasm for having fun (I can’t imagine who she got that from…). Often she would fall asleep in the car on the way back from an outing, but would awake the moment I brought her inside. Since, as any parent knows, the spare moments gifted by nap time are as valuable as gold, especially for someone trying to write a dissertation, I was determined to find a way to keep my sleeping baby asleep! 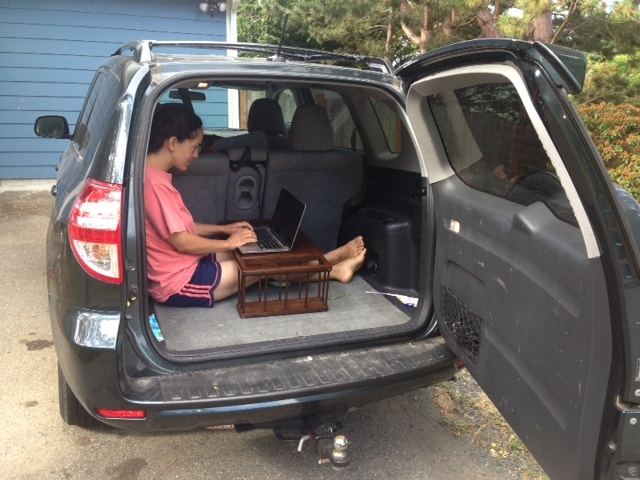 And so, I created Jenny’s Mobile Office. I put a lap desk in the back of my car, and anytime my daughter fell asleep while she was riding in the car, I would pull over, hop into the back luggage area, fold up my legs so that I just fit, open my laptop and work on my dissertation. The best part about this strategy? The views! A glimpse of Jenny’s Mobile Office. Desk, computer, back support, sleeping baby in car seat nearby – what more could a dissertating mother need? 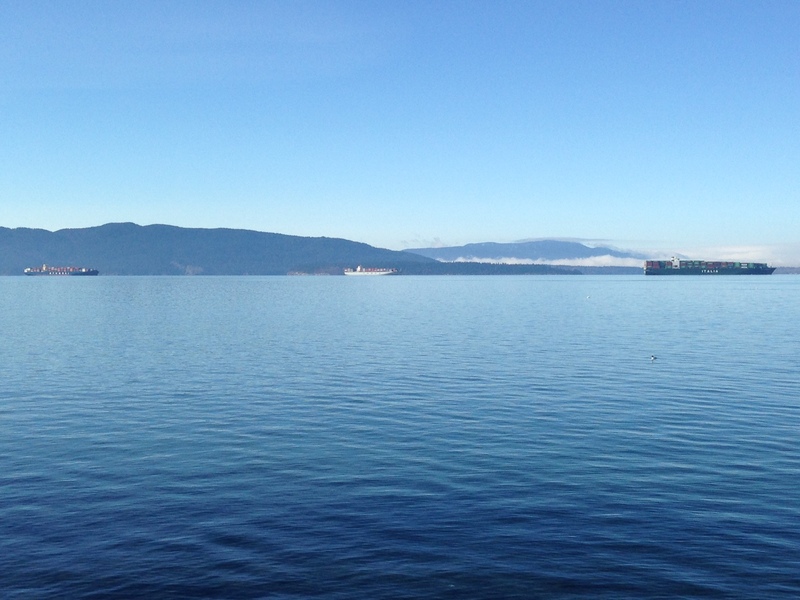 One of the million-dollar views from Jenny’s Mobile Office – Bellingham Bay, looking toward Lummi Island and beyond, Orcas Island. I am delighted to say all of these peculiar places and ways I wrote my dissertation paid off. On Sunday, May 10 – coincidentally, also Mother’s Day – I received the best Mother’s Day present one could imagine: I walked across the stage at Penn State University clutching my diploma, with Tracy escorting me, my own mother beaming in the audience. 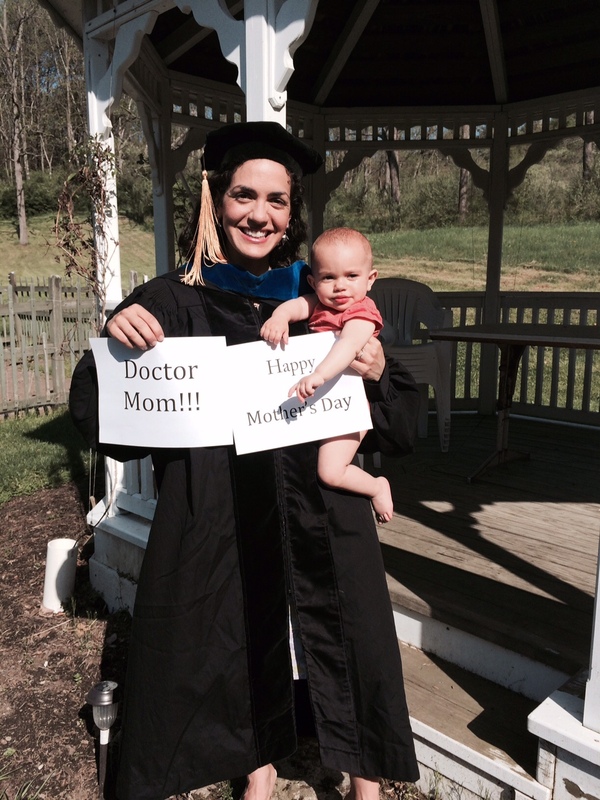 My PhD graduation fell on Mother’s Day – what an appropriate way to celebrate the accomplishments of a dissertator mother. Categories: Articles and Presentations, Lab News | Tags: amphibians, ecology, Research, wood frogs | Permalink. Bushmasters have every characteristic of a mythical creature. When someone describes a bushmaster, they describe a giant, secretive, dangerous snake which lurks the shadows of only the darkest forests. They aren’t mythical beasts, though; they are real – but very rare. This rarity has resulted in the completion of very few studies concerning their natural history, and as such they remain quite a mystery to science. This mystery is all the more dramatic given how impressive and well known they are – bushmasters are the longest vipers in the world and the only vipers in the new world to lay eggs. What’s more, females brood their eggs, guarding them until they hatch – a behavior that’s quite rare among venomous snakes. What is known about them? We know that they are mammal eaters, with studies suggesting that they specialize on eating spiny rats. We know that there are three species in Central America, with another (possibly two) in South America. 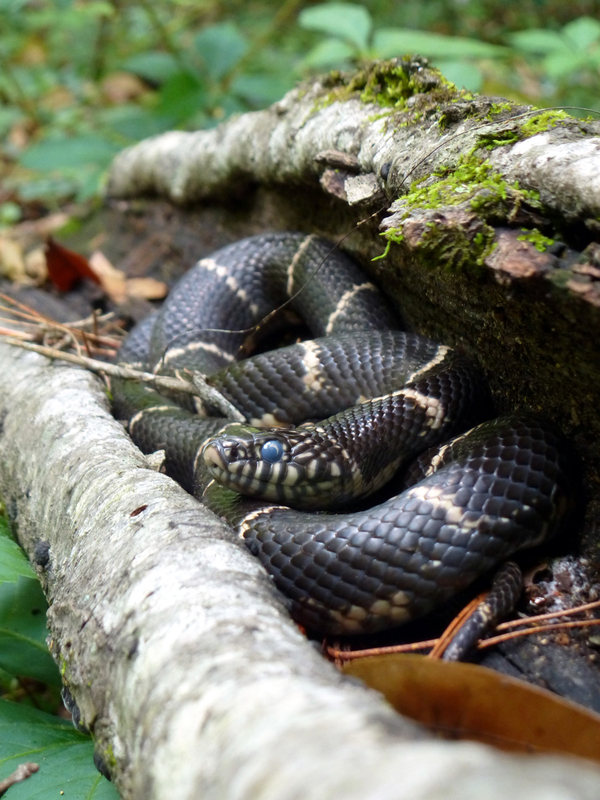 We know that bushmaster bites are a particularly severe medical emergency – although I’ve heard independently from a number of herpetologists that they are behaviorally quite docile. What I think is most interesting is that we know they are restricted to virgin rainforest. Virgin forest is forest which has never been cut, or at least hasn’t been cut for so long that it’s reached the final stage of floral succession. Why are bushmasters confined to virgin forest? There are theories, but the fact is that nobody is sure. The question could have interesting implications to ecology or conservation, especially given that primary rainforest is being cut at an alarming rate globally. In order to explore this question and simply gain insight into the natural history of bushmasters, The Orianne Society has recently initiated its Bushmaster Conservation Project. 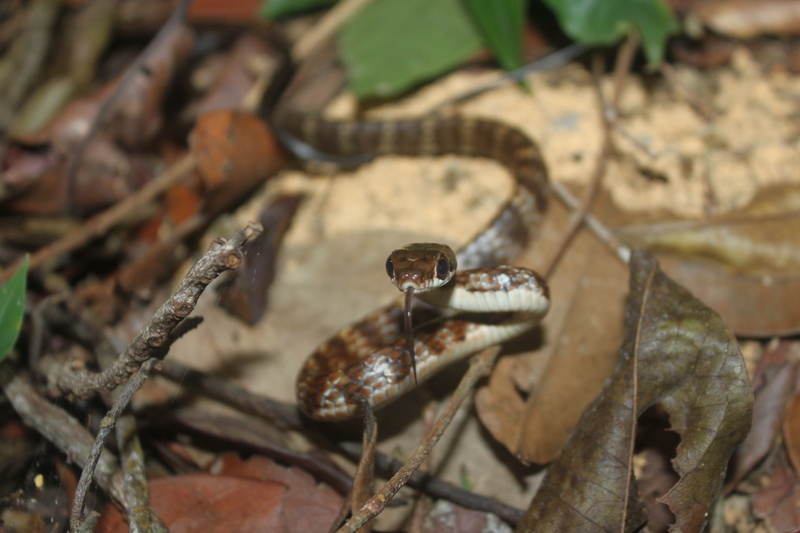 The project’s goal is to study bushmasters in their natural habitat and document important aspects of their natural history, with the objective of learning how these rare snakes might be better conserved. So it was with this project and these goals that I went to Panama with Steve Spear of The Orianne Society and 3 other biologists this July. The project is still in its early stages, and in order to begin studying bushmasters, you need to find them. That was really our goal for the trip, we were to evaluate the study site to determine whether or not enough bushmasters could be found to begin a field study. Our target area was the primary forest in and around General Omar Torrijos Herrera National Park near the town of El Cope, Panama. Would we find our target? Bushmasters are unbelievably rare – I want to make sure you got that. At the World Congress of Herpetology in 2012 I heard Harry Greene (one of the few to have ever studied bushmasters in the wild) say that for his study, it required approximately 400 jungle hours to catch one snake. We had five biologists, one local guide, and would be in the field for 7 days. If we worked 10 hour field days that would be 420 jungle hours. We could do it. Or maybe not. We never found a bushmaster. I wish I could give you some explanation, but in the end they are simply that elusive. The trip was a phenomenal experience for me. 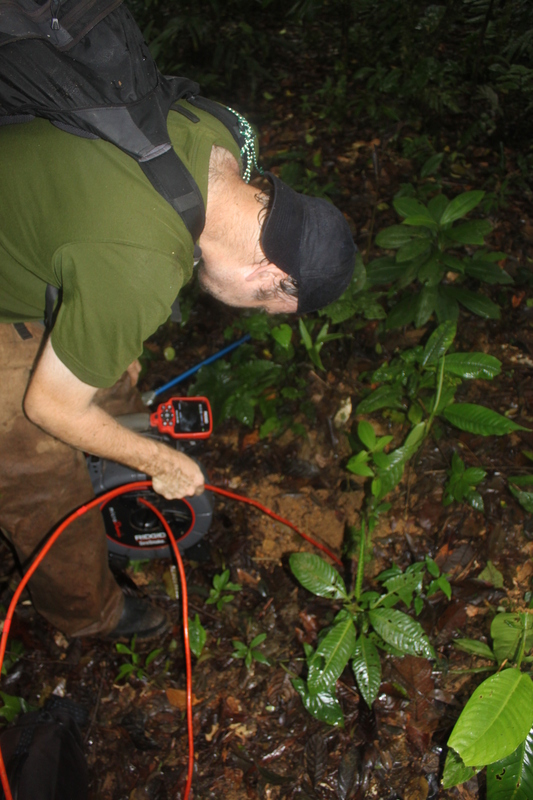 Not only did gain insight into tropical ecology and the biogeography of Panama (where I had never been before this), I also learned to have some serious respect for the energy that it takes to study rare species in the wild. It’s an unreal task. If anyone is up to that task, though, I’m absolutely confident that it’ll be the folks at Orianne. I’ll leave you with a set of photos from the trip. 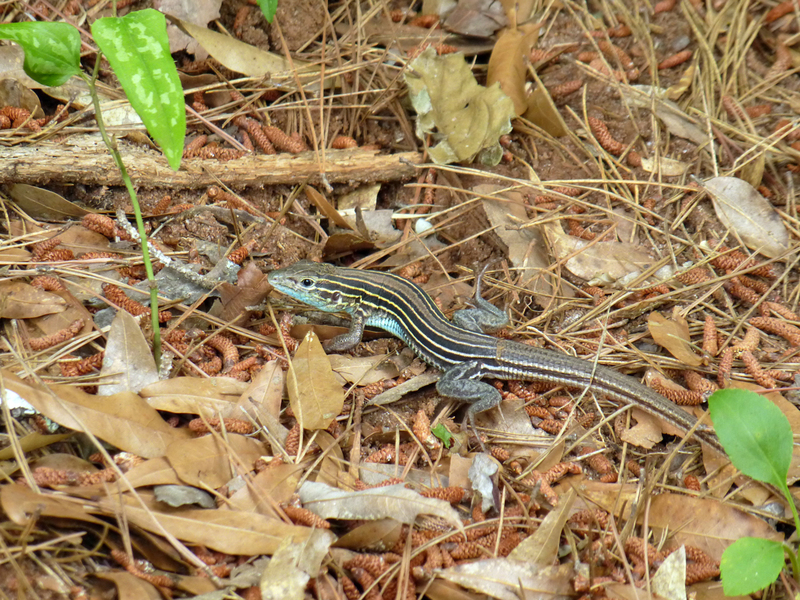 We ended up with ten species of snakes in 7 field days, plus a bunch of other herp species. 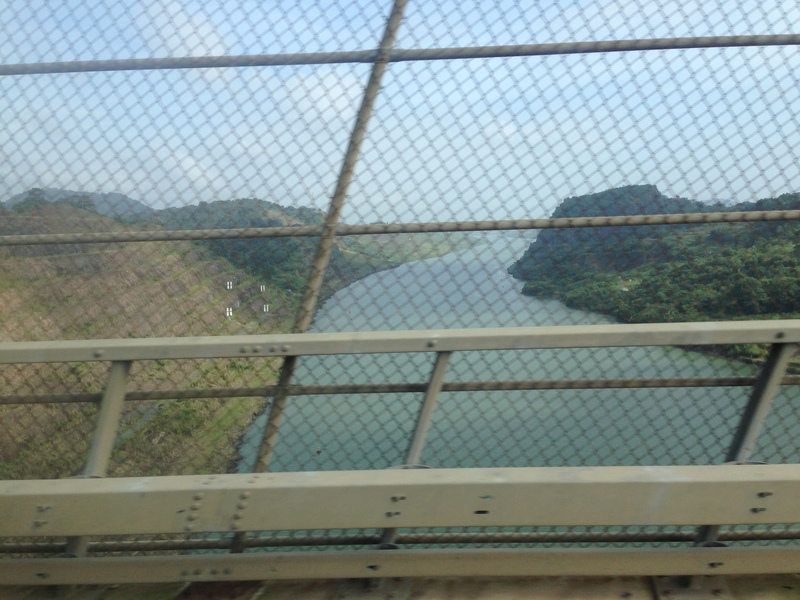 Our view of the Panama Canal as we drove from Panama City to El Cope. We caught this Bird Snake (Pseustes poecilonotus) in the middle of a clearcut on the hike back from our first day in the field. 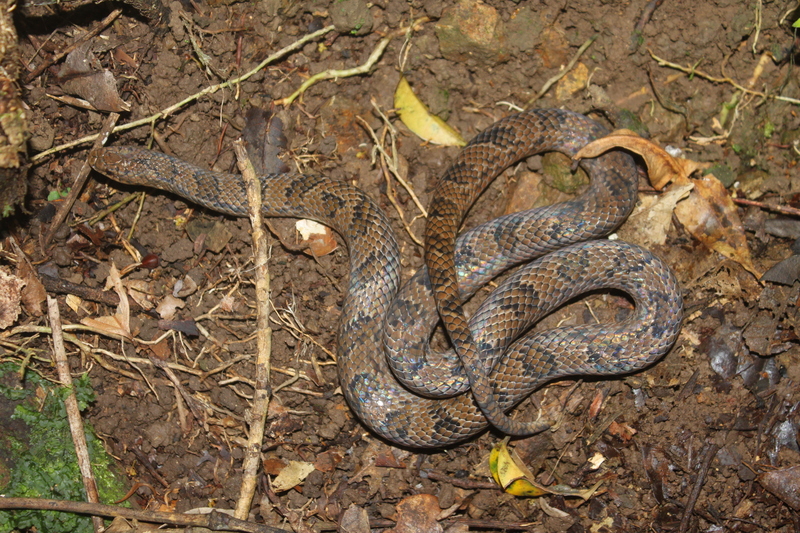 Hours in perfect virgin rainforest without a snake, and then we catch one within minutes of entering a disturbed area. 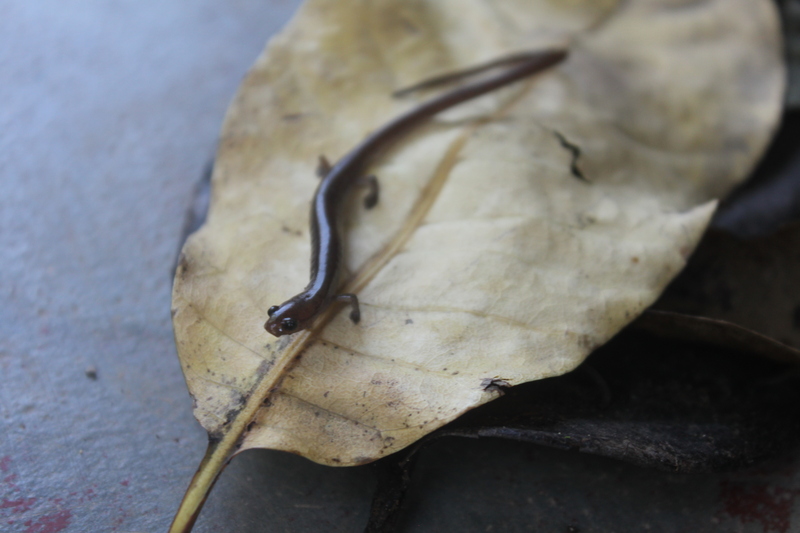 In addition to our own surveys, there was a team of Salamander researchers working in El Cope to document the natural history of Bolitoglossa and Oedipina salamanders. We went out with them on their surveys a few times, and managed to find both genera during the nighttime transect. Here is the Oedipina the next day. This amazingly iridescent Stenorrhina degenhardtii specializes in eating scorpions and spiders. 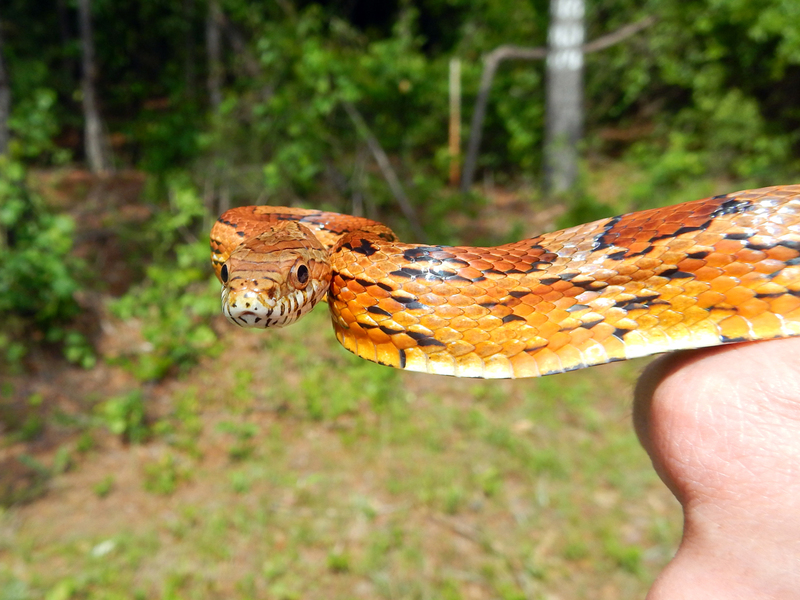 We found this Rhadinaea decorata immediately after the Stenorrhina, it’s actually a congener of the Pine Woods Snake found in the southeastern United States. Dendrobates auratus, the Black and Green Poison Dart Frog. 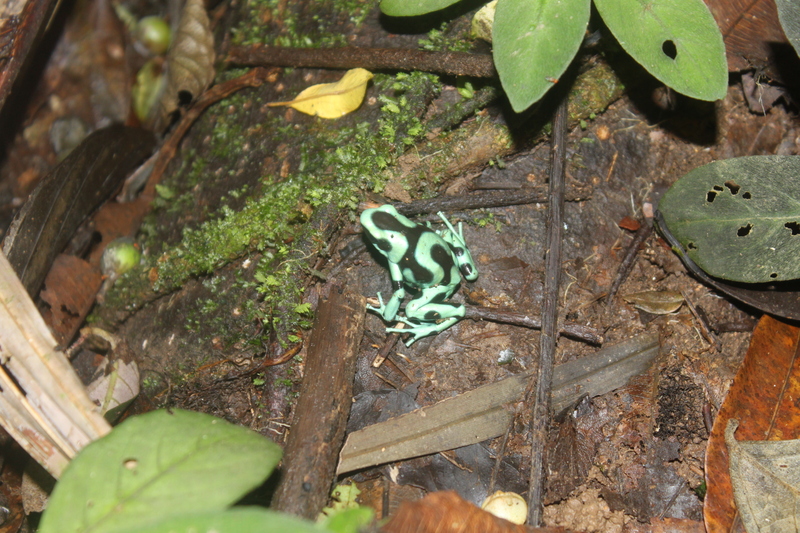 According to the Dart Frog expert on our trip, the D. auratus around El Cope are the more toxic than at any other locality. 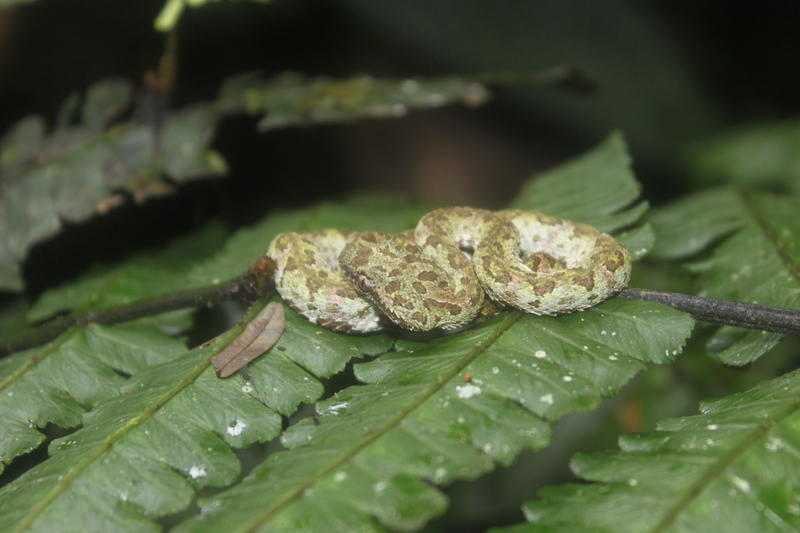 On the second to last day in the field we found our first and only venomous snake: a small eyelash viper, Bothriechis schlegelii. The local name in Panama and Costa Rica for this species is Bocaraca. I’ve been asking for years and I still can’t get anyone to explain to me what that means. One of the ways that we searched for bushmasters was to use a video camera scope to search deep inside burrows where we suspect they spend much of their time. Here is Steve scoping out a rodent burrow. I’ve spent time in the Central American rainforest before, but I’ve never been to Panama. One of the most interesting things about the Panamanian jungle is that you can encounter lots of South American taxa at their northern distribution limit. 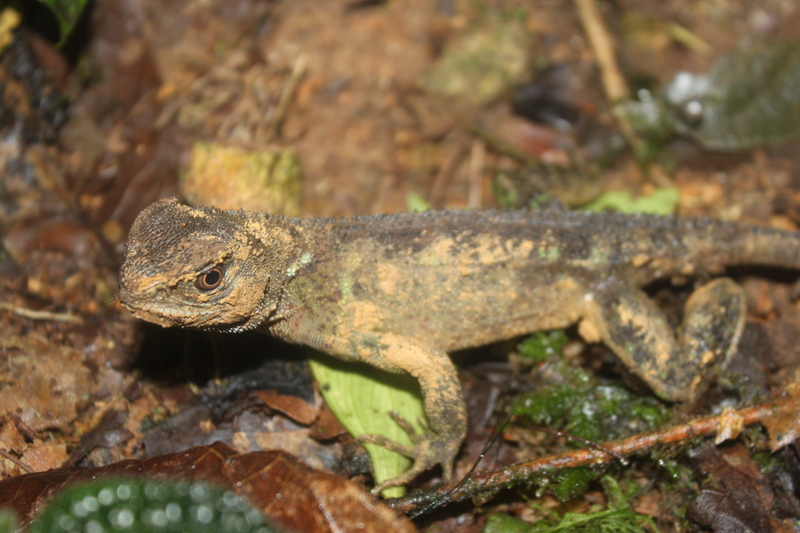 This Spiny Dwarf Iguana is one such species. The genus Enyalioides, is primarily South American, and only this species (E. heterolepis) makes it into Central America (only into Panama). 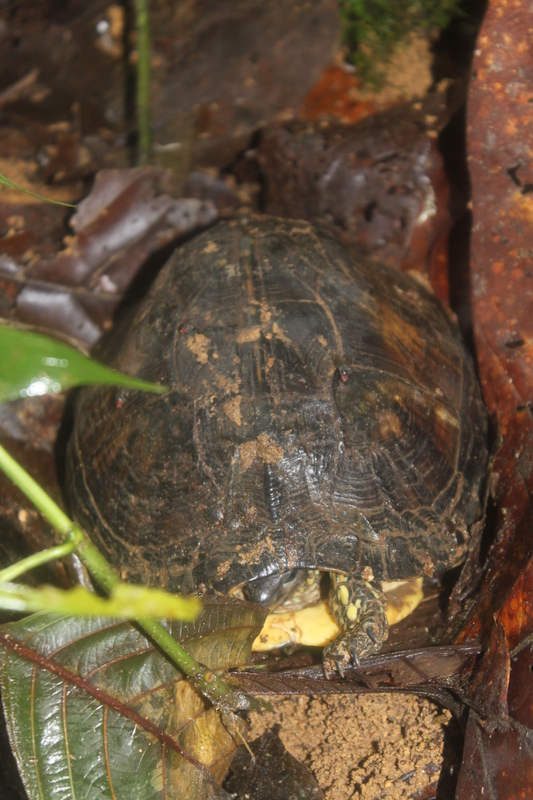 The one turtle of the trip was this Rhinoclemmys annulata. This species is known to be more terrestrial than other members of its genus, and we found this one deep in the forest far from any obvious water source. 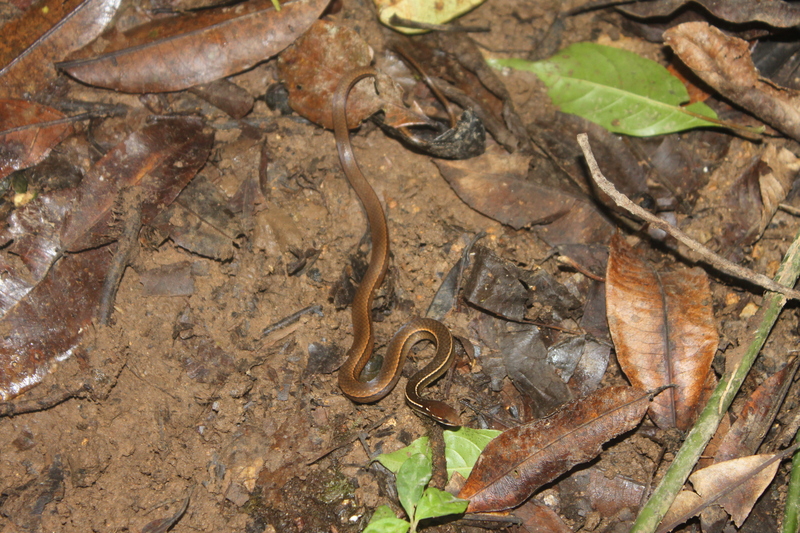 The last snake of the trip was this juvenile Chironius grandisquamis. 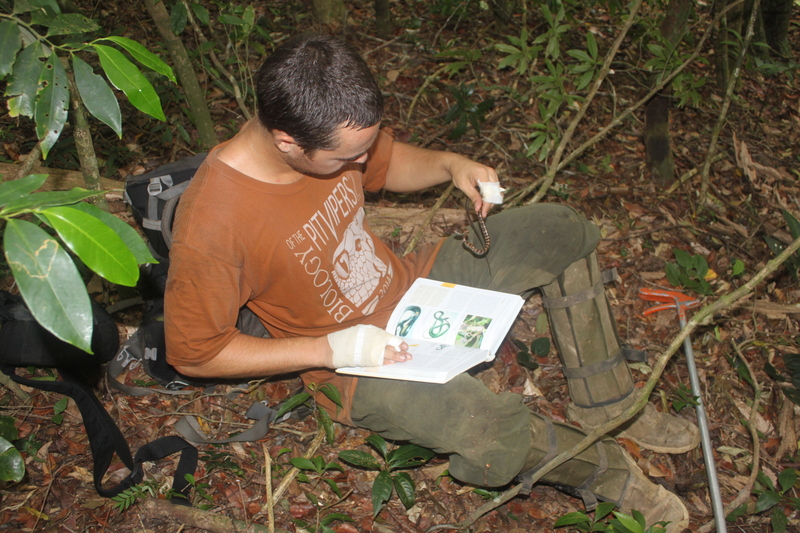 Identifying Neotropical colubrids can be a challenge. We ended up having to use the key in Gunther Kohler’s The Reptiles of Central America to ID the Chironius. 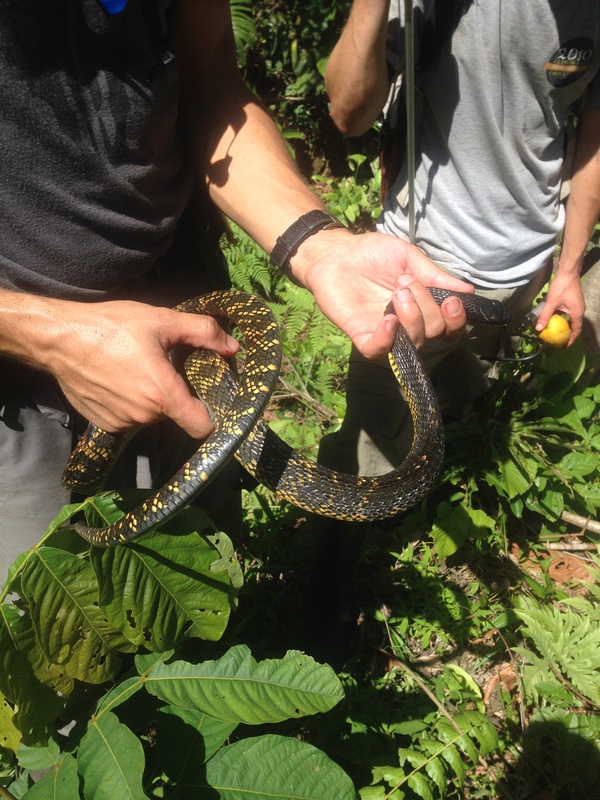 Categories: Fun in the Field, Undergraduate Research | Tags: amphibians, Biology, bushmaster, ecology, Evolution, field trip, herps, Panama, salamander, scenery, snakes | Permalink. Upward Bound Math and Science-Back in Action! This summer the Langkilde lab has the privilege of working with the Upward Bound Math and Science (UBMS) program for a second time. We will be mentoring high school students through the SEECoS program (Summer Experience in the Eberly College of Science). Last year we had the opportunity to work with three outstanding students: Selena Slimmer, Jermayne Jones, and Kiara Camacho. 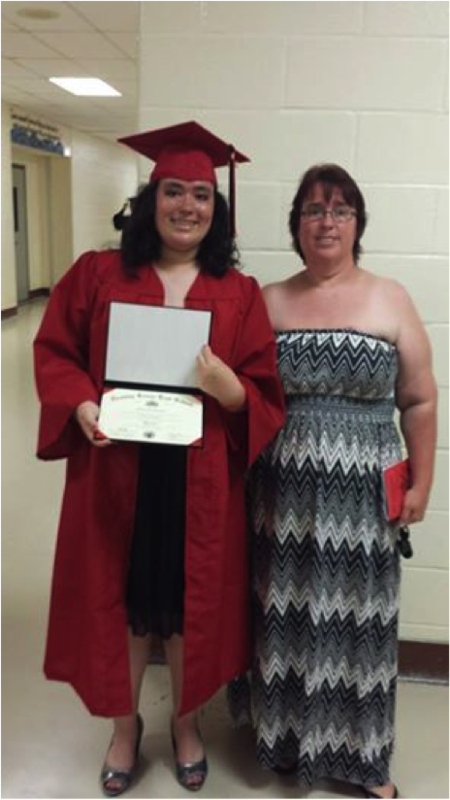 Selena graduated from Reading High School this past spring, and we are pleased to announce that she will be attending Albright College in the fall. Selena will be studying psychology and intends to minor in biology. Congratulations Selena! We are so proud of you, and we know you will be successful in everything you do! Selena holding her diploma with her mom by her side. While Selena is moving on to college, we are lucky enough to be working with Jermayne and Kiara again this summer. Jermayne is a rising senior at Olney Charter High School in Philadelphia, and Kiara is a rising sophomore at Reading High School. Jermayne hopes to study forensic science at Penn State, and Kiara is interested in photography. Last summer Jermayne and Kiara worked with us on a project studying tadpole behavior, and this year they are jumping in head first with a lizard project! Our enthusiastic research team! 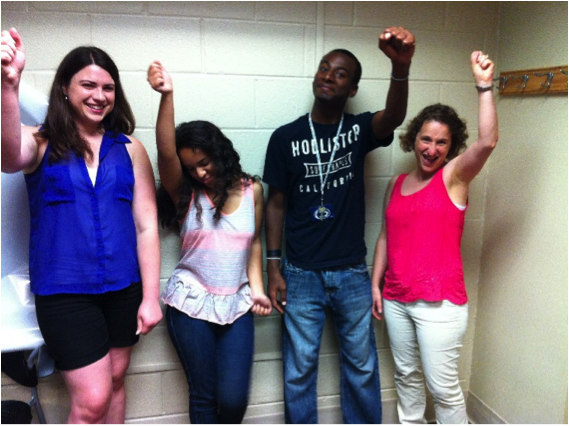 From left to right: Melissa O’Brien, Kiara Camacho, Jermayne Jones, and Dr. Tracy Langkilde. Photo taken by Dr. Lori Van Der Sluys. Jermayne and Kiara will be helping the Langkilde lab study stress levels in the Eastern Fence Lizard (Sceloporus undulatus). In this experiment, we will be measuring a stress hormone known as corticosterone (CORT for short). In order to take a blood sample, we catch fence lizards using a fishing rod with a noose attached to its end. 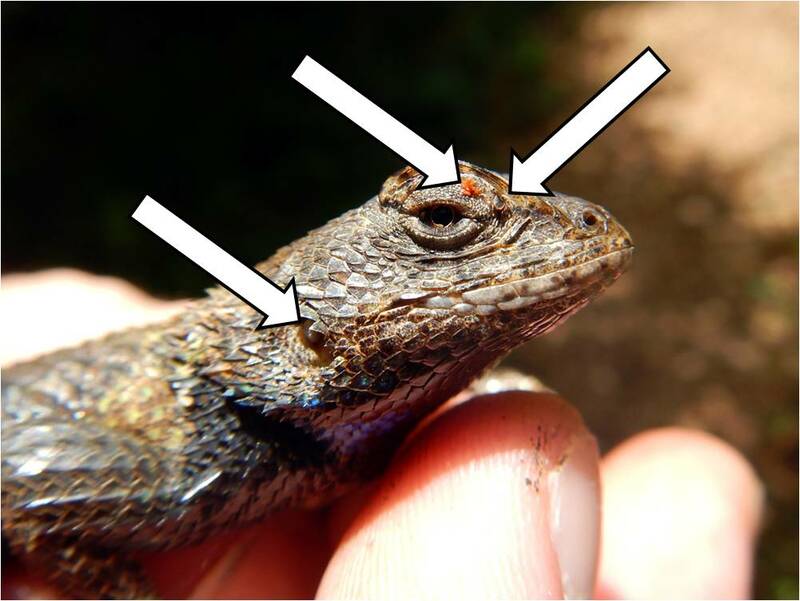 Once we catch a lizard, we remove the noose and use a capillary tube to collect blood from the sinus behind its eye. 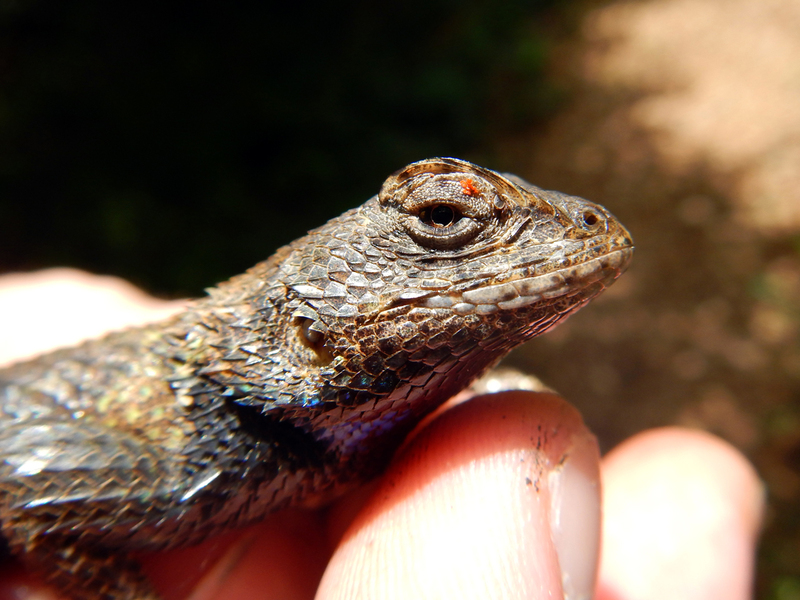 The process of catching, handling, and obtaining a blood sample is stressful for lizards, so if we want to get a look at natural or baseline stress levels in lizards, we need to take a blood sample before CORT levels begin to rise. According to previous research, it takes about three minutes for CORT levels to rise in birds and mammals, and we want to determine whether or not this holds true for reptiles. 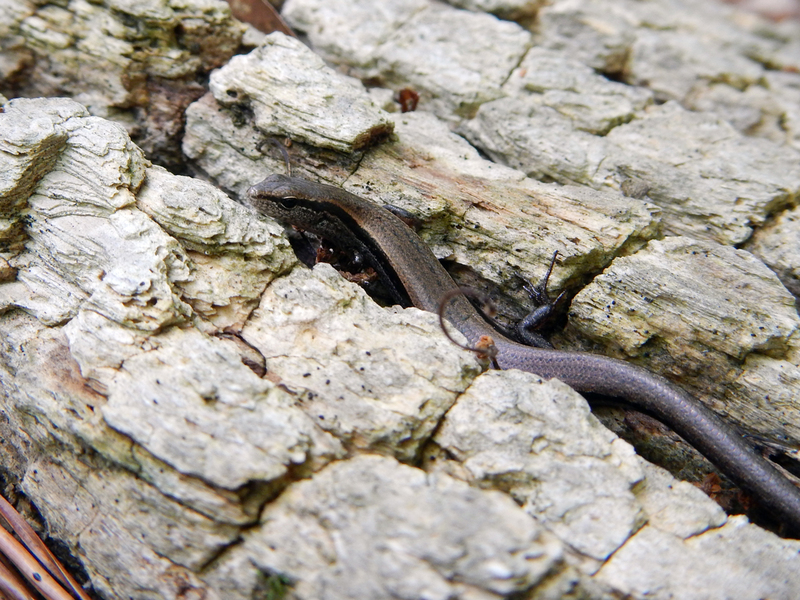 In order to find fence lizards to work with, we ventured out to Raystown Field Station two weeks ago to scout out a field site (check out Mark Goldy-Brown’s blog post if you are interested in learning more about our first trip!). 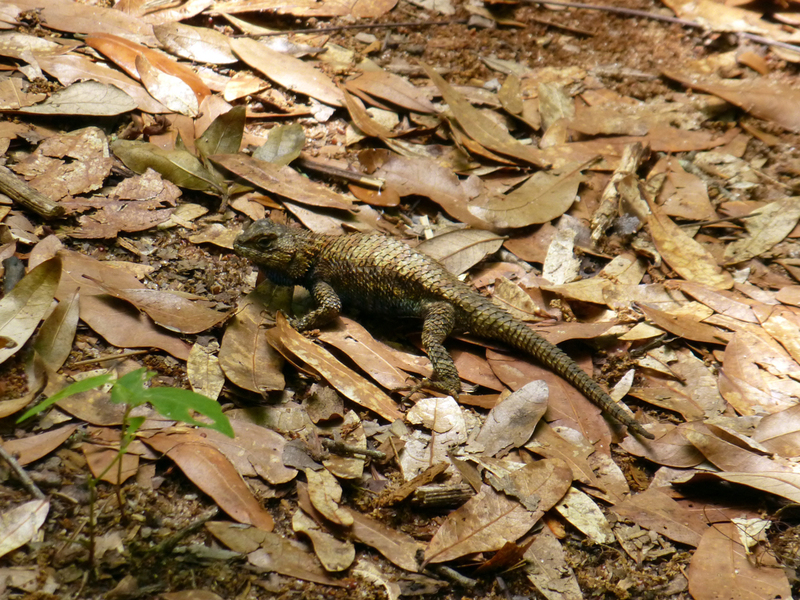 Last Thursday, we returned to the field station in hopes of catching additional lizards for our study. When we arrived, we realized that the weather in Juniata was not conducive to catching fence lizards, but that didn’t stop us from trying! While we waited for the rain to subside, we gave Jermayne and Kiara a crash course in fieldwork. We even used plastic lizards to practice catching fence lizards. 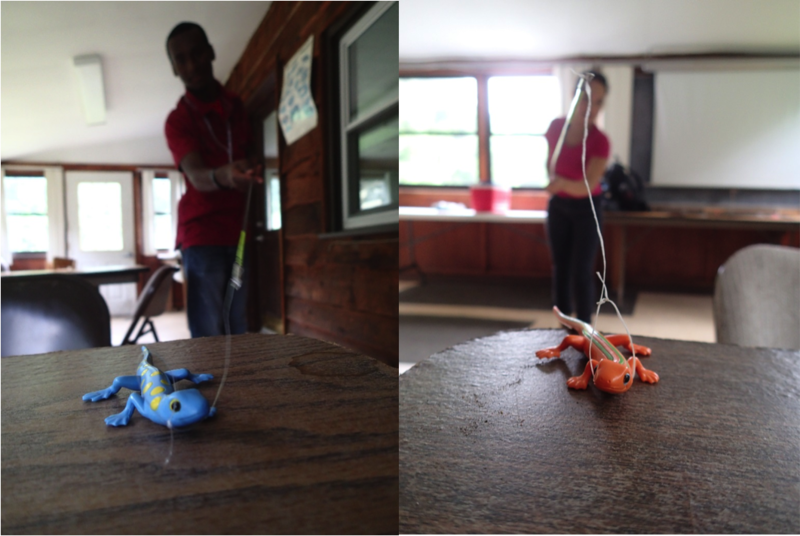 Jermayne (left) and Kiara (right) practicing their “lizarding” skills. Photos taken by Tracy Langkilde. While the weather prevented us from catching fence lizards, we did get the opportunity to see some wildlife. Andrew McDevitt, Resident Director of Raystown Field Station, found two Ring-Necked Snakes that Jermayne was brave enough to hold. 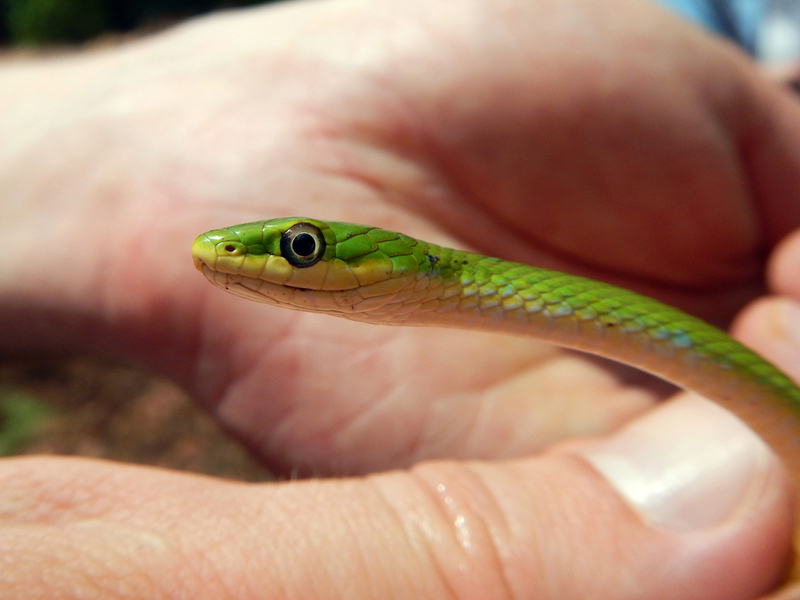 These snakes get their name from the orange ring found around their necks. Ring-Necked Snakes are harmless to humans, and our students enjoyed getting the opportunity to interact with such docile reptiles. 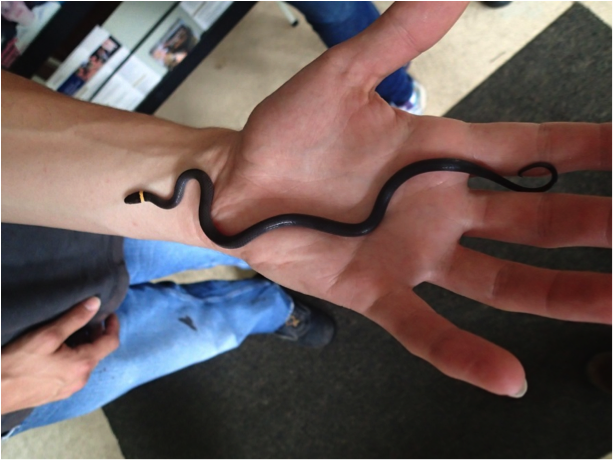 Jermayne (left) holding a Ring-Necked Snake. Kiara (right) posing with a Ring-Necked Snake. Photos taken by Tracy Langkilde. This Ring-Necked Snake gets its name from the orange ring around its neck. Photo taken by Tracy Langkilde. 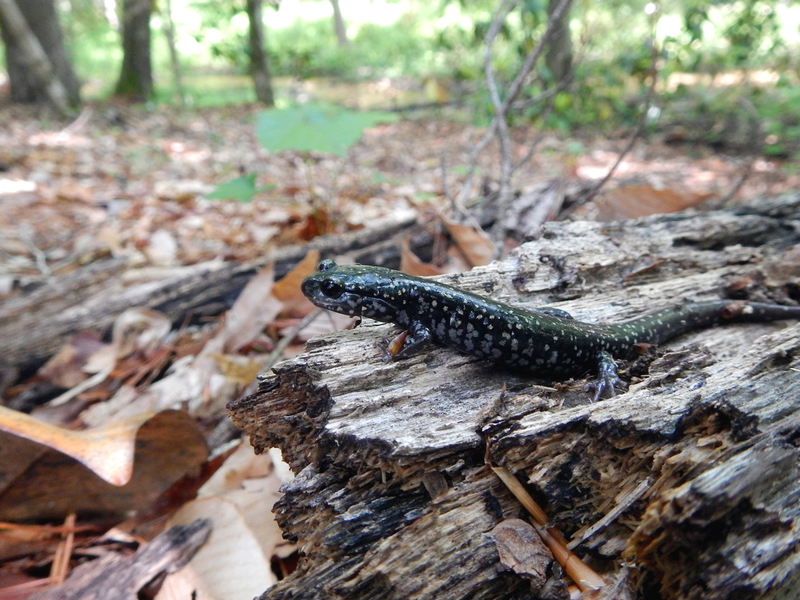 We also took a hike around the base of the field station where Chris spotted a slimy salamander. Chris explained that these amphibians get their names from the sticky mucous they secrete to clog the mouth of a predator. 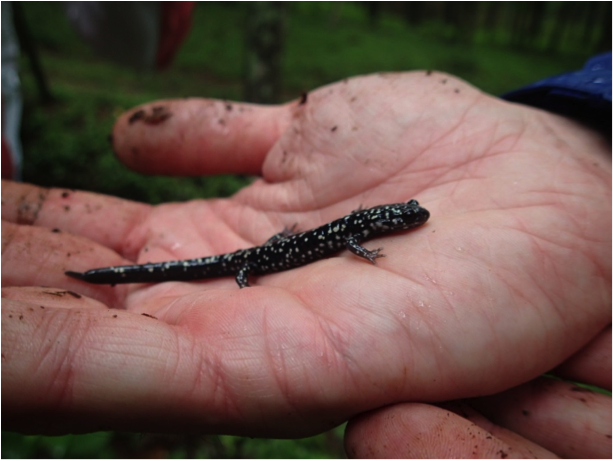 We also learned that slimy salamanders are good jumpers, and quickly returned our friend to the log where we found him. Chris Thawley holding a slimy salamander. Photo taken by Tracy Langkilde. Our team investigating the slimy salamander. From left to right: Chris Thawley (holding salamander), Tracy Langkilde, Gail McCormick, Kiara Camacho, and Jermayne Jones. On the ride back to Penn State, Tracy spotted a baby box turtle on the side of the road. 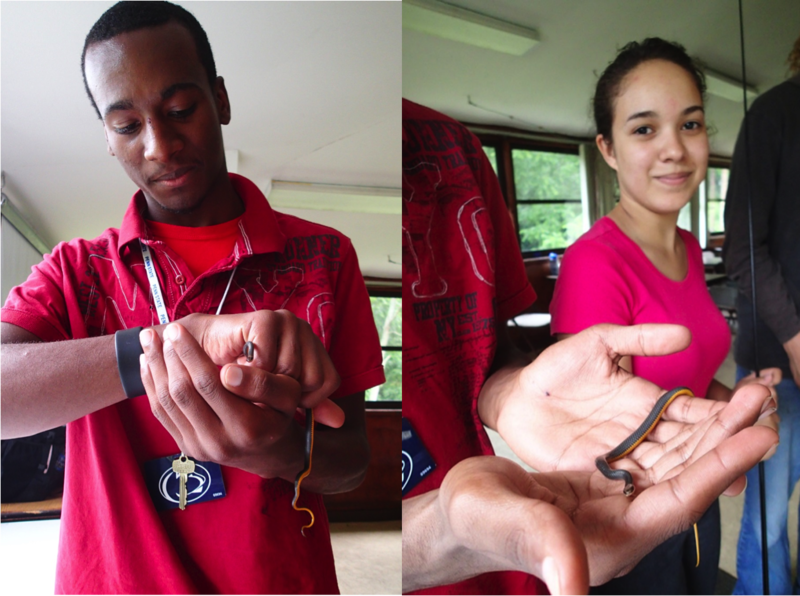 Kiara and Jermayne both took the opportunity to take photos with this adorable herp. 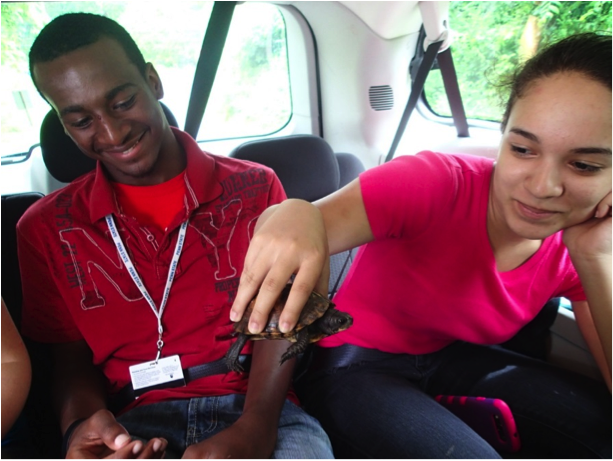 Jermayne and Kiara posing with their box turtle friend. Photo taken by Gail McCormick. We are eager to get back into the field next week to catch some fence lizards! Stay tuned for updates on our lizard project! 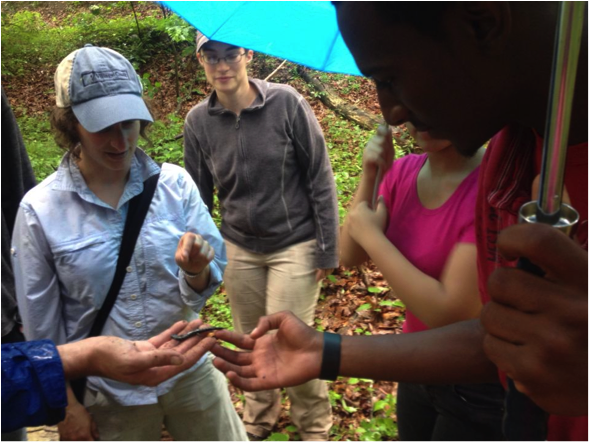 Categories: Fun in the Field, Research in PA, Undergraduate Research | Tags: amphibians, by Melissa, fence lizard, fence lizards, field trip, herps, Pennsylvania, teaching | Permalink.